I never was a real meat-eater. First of all, I didn’t particularly appreciate the taste of steaks and other meat like that. Blood in meat horrified me, while I have no problem with blood at all in any other situation. As a child, my mother told me that the meat came “from the fabric”, otherwise I wouldn’t touch it. I wouldn’t eat an animal. When I found out she had lied to me, meat eating was over. However, later I convinced myself to eat chicken and also always appreciated corned beef and some kind of salami. That is really good stuff for me, and still today, I see the corned beef on the table with one eye crying because of the animal, and the other one because of the good taste I’ll never enjoy again. Well, I guess I can’t tell for all my life as I wish I’ll still have to live for quite a while, but for the past three years, this has been the truth and I guess I won’t change this anymore. Promises to myself have always worked very well. There’s a lot to say to this. However, I can’t force people to think and act my way. I only can try to inform them. To show them what they’re actually doing. And then, they choose. For myself, I have chosen to not eat meat. I don’t want the horror of a conscious being that goes to death in my body. I also don’t want to eat eggs from chicken kept by industrial farming. If I don’t find eggs from “happy chicken”, I will not buy them. And so on. So these are my choices – because I’m convinced that animals and human beings basically feel the same (and I could explain this by the structure of their brain and nervous system). So the following story published and shared on World Truth TV’s Facebook page, gives me right and supports everything I think and just said. It is a positive story. Enjoy it! 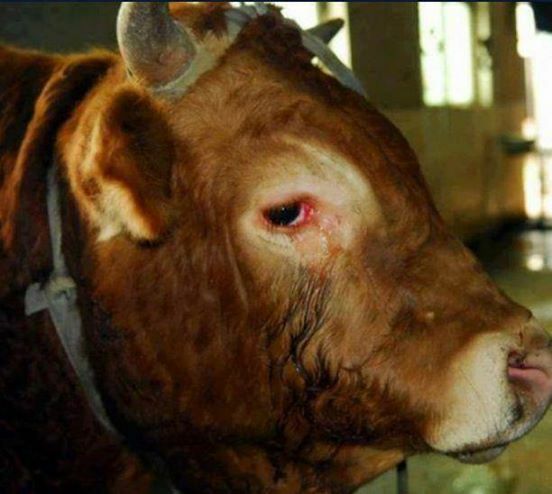 A bull in Hong Kong was reported to cry and beg for his life!Workers in a slaughterhouse were surprised when the bull suddenly knelt and cried before it was taken into the slaughterhouse. Shiu, one of the workers, said that he trembled when he saw the bull’s teary eyes.They continued trying to pull the bull inside, but failed. The crying bull just would not budge. The workers were moved and decided to gather funds to purchase the bull and give it to monks, who would take care of it. When they decided not to kill the bull, the creature stood up and followed them.